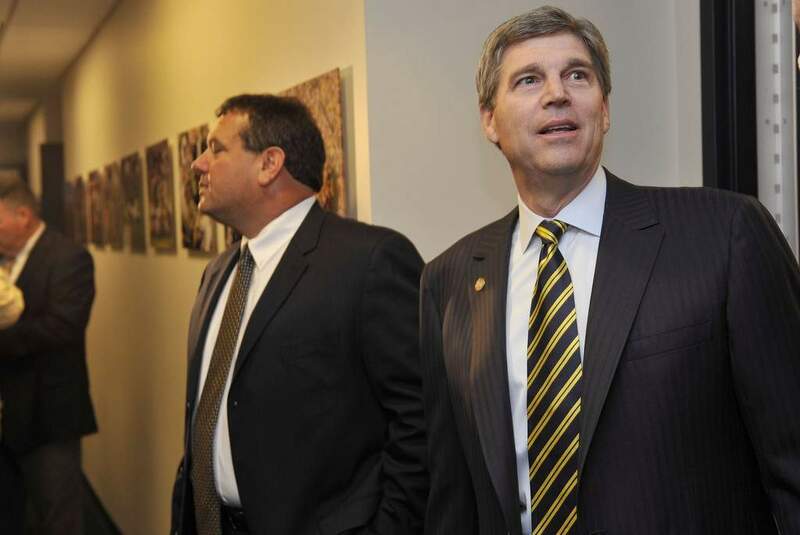 Michigan AD David Brandon and head football coach Brady Hoke. • He's successfully brought night games to Michigan Stadium with the announcement of the first ever night-time kickoff set for the Notre Dame game in week 2 of the 2011 season. • He inherited a football coach embroiled in controversy from inside and outside of the football program. • He took the reigns of the "Big Chill" and guided that event to a very successful end, concluding in a Guinness World Record for the largest crowd to ever attend a hockey game. • He fired his football coach, and embarked on Michigan's 2nd head coaching search in 3 years. • He hired former Michigan assistant Brady Hoke, a relative unknown among Michigan fans, after it was widely rumored that Jim Harbaugh, and then Les Miles would be named to replace Rodriguez. • And then just last week, the University of Michigan announced a $20 million dollar project to replace the scoreboards at Michigan Stadium, Crisler Arena and Yost Ice Arena. ANN ARBOR – The University of Michigan Board of Regents voted unanimously Thursday (Jan. 20) to install new high definition (HD) video scoreboards at Michigan Stadium, Crisler Arena and Yost Ice Arena. The boards will be installed at each venue prior to the 2011-12 season. Due to the construction at Crisler Arena, the Michigan Sports Television Production Studio, which manages and controls the video boards, will be relocated to Michigan Stadium until the arena is completed in 2012-13. The athletic department will convert to high-definition equipment with the installation of the new video boards. The estimated cost of the project is $20 million. The athletic department will be funding the project through internal resources. You may recall us talking about this a while back after the Big Chill. Michigan's outgoing scoreboards were installed prior to the 1998 season. While this came as great news to pretty much Michigan fans everywhere who have watched an event in these three venues in recent years, the advertising question still remained. The cost of running an athletic department at a major university is only getting more expensive. And at Michigan, new stadium renovations, both at the Big House and at Crisler are costing UM well over a quarter of a billion dollars. I do not know the all of the details about the financial situation inside the athletic department, I know Michigan brings in well more than they spend, but I can only assume that changes are going to be needed in order to continue the positive stream of revenue for the department. So my question is this. 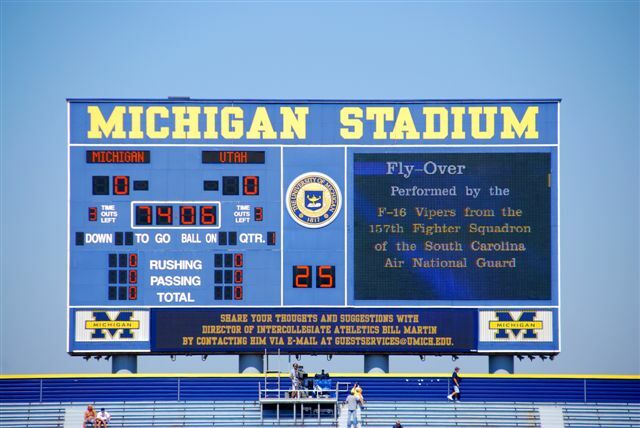 With the addition of these new video boards at the Big House, are we going to see an end to the no adverting policy inside the stadium? Since the beginning of time, Michigan has refused to sell advertising space inside the bowl of the stadium. But with the old traditional scoreboards going away, and video boards replacing them, there could be a possibility of "temporary" adverting in the form of ads that appear on screen and then go away...much like they did for the Big Chill. Q: Hockey is different with advertising on the ice and boards. 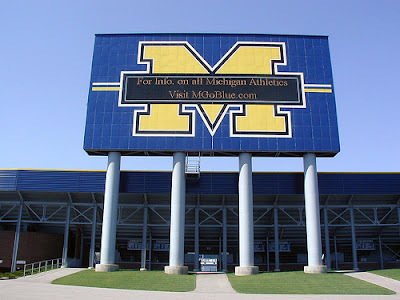 Does it offend you in any way to have advertising (during Saturday's game) in Michigan Stadium? Is this something you would entertain in the stadium during football games? A: These sponsors have been sponsoring our hockey program, many of them for years. They're one of the reasons why our hockey program can be as successful as it is. When you go over to Yost, this is what you see on the boards. This is what you see, display advertising. We use the ice, we use the boards, and from day one, as we created this (game), we wanted to give those sponsors the same opportunity because it's a hockey game. This is kind of how hockey works. Q: But do you ever see advertising in the stadium for football? A: No. I think our fans, even though it's pretty prevalent in most venues, I think one of the things the fans enjoy about their days at Michigan Stadium is they're not being bombarded by advertising messages, and I can understand that. I went to all the away games this year, and you go to those venues like Penn State or Ohio State and they have commercials running and videos and display advertising. As I've said over and over again, I borrow a line from Sam Walton. He said that if you don't know what to do, ask your customer. All of the research and input we've gotten from our customers is that they really don't like or want that as part of their game-day experience inside the stadium, and I respect that. Since we've been getting some folks inquiring about the possibility of ads on the new big screens, we decided to go right to the source. In an email sent to UM media relations, they replied and confirmed that the new video boards will not be used for corporate advertising for football games. So with advertising not being an issue (at least for football), I am all for these new video boards and I look forward to seeing how they fit in with the facade of the new structures. I for one am all for a total video board surface with no metal or "frame" of any kind around it. If we could go 20% larger than Texas' Godzillatron, I'd be satisfied. What say you? As a man, a Michigan Man, I certainly am for the bigger video boards. As for in-stadium advertising, I have no problem with tasteful and appropriate ads - especially, if it means the ticket prices remain as they are currently priced. I entered a contest showing off my Michigan game room, and I'm afraid OSU fans are lowering my score. Can you help out a true Blue fan?